Jesus saves. Except when he doesn’t. I’ll probably catch a lot of hell for this one but this is *my* sandbox. I recently read a piece in The New York Times about Bethany Hamilton. She’s a professional surfer who, at 13 years old, had her arm bitten off by a shark while surfing in Hawaii. They made a movie about her. 10 questions. Four of her answers mentioned Jeebus. When people shoehorn their religious beliefs into every facet of the conversation, they always come off as sounding kind of brainwashed to me. Like they’re stumbling around in a narcotic stupor. If I were Bethany and I had a special relationship with Jesus, I’d ask Him why the hell a shark ate my arm. And, as long as I had his attention, why entire villages were swept out to sea in Japan. Oh…excuse me…I forgot my place. My catechism classes are long behind me. We are never supposed to ask questions. Keep your head down. Give thanks. I’m a sinner. I believe in the Holy Catholic Church. But don’t ask why. God gets all the credit, but none of the blame. That’s a pretty sweet deal. How can I swing that at work? My Bride went to a Ladies Party on Sunday afternoon. A Ladies Party is where someone invites all of her lady friends over and then proceeds to sell them stuff. I think this all started in the 1950s with Tupperware. This time, it was jewelry. Sometimes, it’s clothing or make-up or cleaning products. I take a suspicious view of all this. If I had a bunch of guy friends over for beers and poker and tried to sell them gym memberships, I’d probably get a good swift kick in the nobby-halls. I gathered The Daughters and escaped into the city. It’s finally starting to become spring-like. 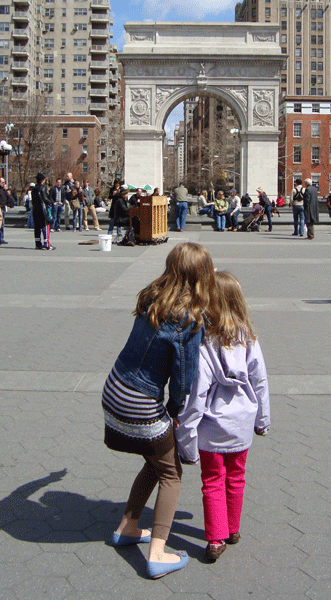 I took them to a play in Greenwich Village but before the show we hung out in Washington Square Park for a bit. I wonder what she was pointing out? I’ll never know. There’s always a busker or two around. Someone rolled a piano into the park and was played Gershwin’s Rhapsody in Blue (see pic above). After that we watched a contortionist fold himself into a tiny Plexiglas cube. What a way to make a living! I’ll bet it beats the hell out of sitting at a desk all day. That’s no fun. Take it from me. I took them to see the sickeningly talented Flying Karamazov Brothers at the Minetta Lane Theater. The Brothers (who aren’t) are world class jugglers and also pretty damn good musicians, dancers and comedians. 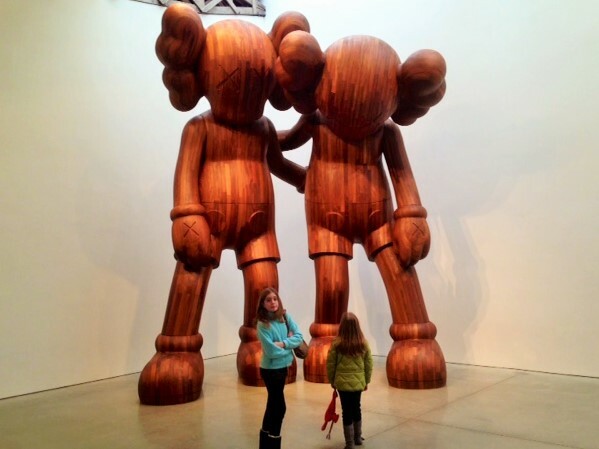 I saw their show last fall and had been meaning to take the girls. I read that they’re packing up their flaming torches, pins and tutus and heading off to London, so I got tickets to their last day in New York. As satisfying as ever. UK readers; they’re starting a summer run at the Vaudeville in June. They’ll make you forget all your troubles for :90 minutes, and who couldn’t use that? Before the show, we were sitting in a booth at a diner on 6th Avenue, me across from the two of them. I sipped my coffee and watched them eat. Two healthy, happy, well behaved, pretty little girls. I looked out the window at a sun-soaked Manhattan. Show tickets in my pocket. A hot meal waiting for us when we got home. Tickets to a top-shelf production of Shakespeare’s The Comedy of Errors for next week. Can someone tell me where my sanity is? Why, while possessing all the ingredients for a satisfying life, do I still occasionally want to run someone off the freeway into a bridge abutment if I see them using the cell phone while driving? Why do I allow some people at work to burrow so deep under my skin that I’d like to stick a pencil in their eye? Why do I fret about bull whipping the first person who breaks my daughter’s heart (which, let’s face it, is inevitable)? Is this part of the human condition or is it my singular madness?